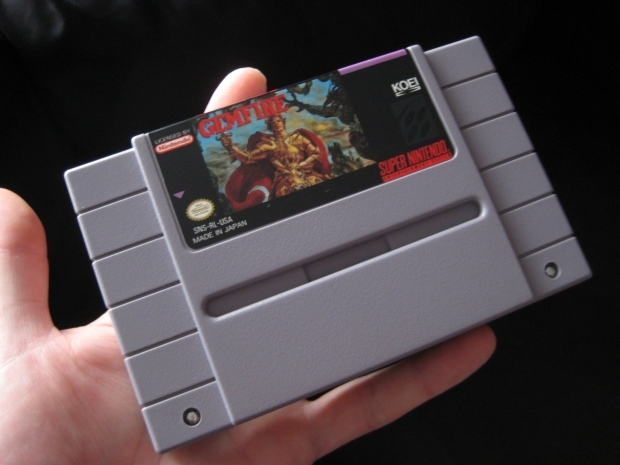 Retro games, by definition, are old. When you find these old games in the wild, you will most certainly come across many that are absolutely disgusting. Some of these games are beyond hope; their owners severely mistreated them over the years. However, sometimes you'll come across a dirty one that just needs a little spit polish to be good as new. Today we're going to take a look at the process of cleaning up and restoring a Super Nintendo game I bought. The process for doing this is not exclusive to Super Nintendo, but for the purpose of this feature, I'm going to talk about Super Nintendo specifically. Why must they put the price tag over the back label?! As I stated earlier, some games are beyond hope for restoration, but many can be saved or if anything cobbled together with pieces from other games to make one good one. When buying used games like this, you come across many games that are absolutely filthy. For myself, before a used game makes its way into my collection, I like to clean it up to make it look as nice as possible. Let's take a look at this game I bought. I visited a local pawn shop and found a copy of Gemfire for the Super Nintendo. Like many games I see at the pawn shop, Gemfire was quite dirty and covered in stickers and grime. I have saved games much dirtier than this one, so I knew that it wouldn't be that difficult to save it from further deterioration. You can see a silver sticker wrapped around the side of the cart. This definitely needs to be removed. There is also dark grime around the rental sticker, leading me to believe that it at one time had a different and larger sticker in the same location. This game was obviously a rental game at some point, and presumably from more than one rental store, so you can imagine how many times this game has changed hands. I would also like to point out that the pawn shop I go to likes to put their price tag directly across the sticker on the back. This annoys me because it's something else I have to concern myself when trying to restore a game, but I can normally remove them without tearing the back sticker. Rental stickers are a real pain to remove because they typically leave behind silver residue with the word "void" in it. Many times when you encounter games that were once from a rental store, you find that someone at some point already removed the sticker but made no effort to remove the sticky residue left behind. This residue, over time, has no doubt collected debris, hair, and other unpleasantness. What these people apparently didn't know about is a fantastic product called Goo Gone. When purchasing Goo Gone, I advise you to not get the product in the spray bottle. This product looks very similar to the one I use, so I would recommend choosing that one. You're going to want to be very careful when using Goo Gone on games because it can destroy labels just as easily as it can clean them. Spraying Goo Gone onto a game is asking for disaster, so be very careful with how much you get on the game and where you're putting it. In fact, now might be a good time to discuss the supplies I use when cleaning games. 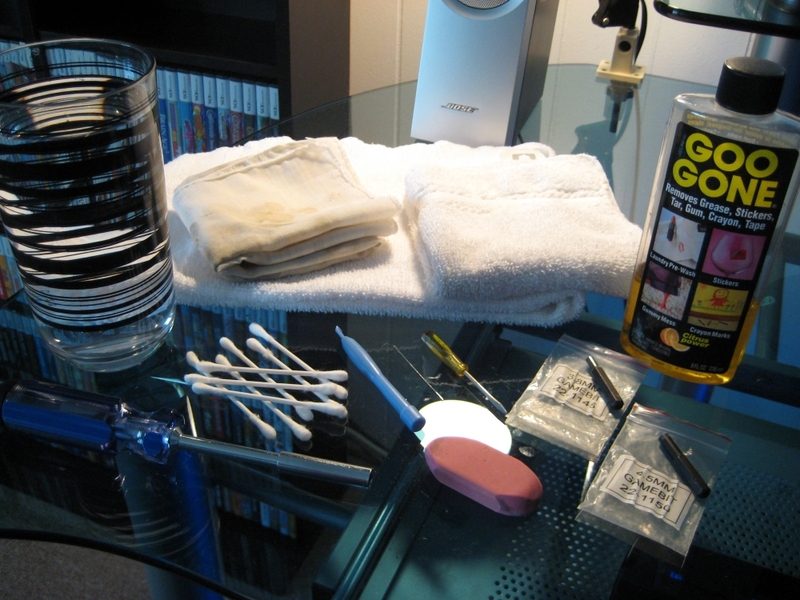 In the above image, you can see a damp washcloth to wipe games down with, a dry hand towel to dry them, cotton swabs, a handkerchief to use with the Goo Gone, a bit holding screwdriver, a scraping tool to clean crevices, a thick needle break apart really tough grime, an eraser to clean corroded contacts as a last resort, and security bits to open games. You can purchase the security bits to open your games from MCM Electronics. On MCM Electronics' website, the part numbers for the security bits you'll need are 22-1145 and 22-1150. These bits will open most Nintendo and Sega products. I highly suggest you buy security bits to open games. I removed the silver rental sticker and it surprisingly left very little glue residue behind. Upon removing it, I discovered that someone tried to scrape the previous residue off before applying the thinner sticker. When they did this, they left a deep gouge in the plastic itself. Ouch. Oh, well. 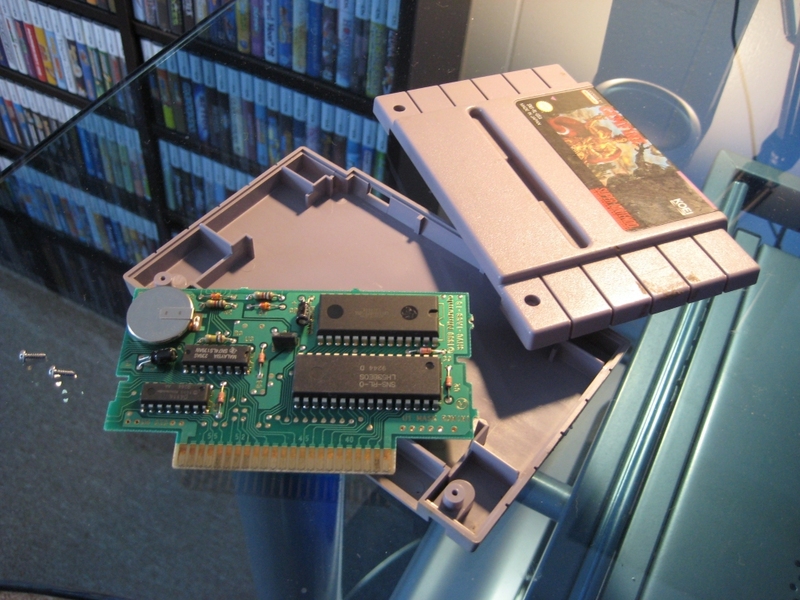 I didn't intend on leaving this original back plate on the game anyway because it was discolored. I opened the game and took a look at the inside of the game and saw that the contacts on the game board were in pretty good shape, so there is no concern about them not working when we're done cleaning them. People use different solutions for cleaning, but diluted alcohol seems to be the most popular one. Dip a cotton swab in the solution and scrub it across the contacts. After doing this, there was still a bit of discoloration on the contacts, so I took the eraser to the affected area and cleaned it up. This was fairly unnecessary, but I wanted to remove what little discoloration there was to make it look as nice as possible. I have read that a "white eraser" is better for cleaning contacts than the one I own. I should probably invest in one. As I mentioned before, I didn't intend on keeping the original back on Gemfire because it was discolored and had a gouge in it. However, since I am going to replace it with a a back from another game, I do want it to be cleaned up as much as possible. When I bought Gemfire, I also picked up a copy of Rise of the Robots so I could switch the backs out. 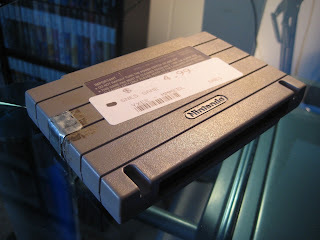 However, when I removed the price tag from the back of the game, I discovered why the pawn shop put their price sticker where they did: The entire back label was ripped apart. So the game I bought solely to use the back for has a ripped up back label. Perfect. In the end I wound up using the back from a duplicate copy of Jungle Book I accidentally bought previously. 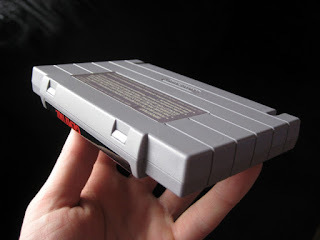 I recently discovered that there are people that care about whether or not the back half of the carts are original. On the back of each cart, there are numbers stamped into the label. If you are one of those people, make sure the numbers stamped on the back of the cart you replace it with are the same as the numbers that were originally on it. I, however, am not one of those people, so Jungle Book is good enough for me. So after switching out the backs on the games, cleaning the contacts, and giving it one final wipe down with the dry hand towel, we're left with what I consider to be a nearly mint copy of Gemfire. Well, at least more mint than it was when I bought it. The back to the game, which admittedly is from a different game, vastly improves the overall look of the game from when I bought it. It's a bit blurry, but the front, which you can see at the bottom of the page, also looks pretty good. Compare that with how it looked when I brought it home, and you can see how much of a difference it makes. And that's all there is to it! Every used game I buy gets thoroughly cleaned inside and out, and the end result is usually a night and day difference to how it looked when I acquired it. You learn quickly what you can and can't restore. Used games from the pawn shop, at least the ones I frequent, are some of the filthiest, most disgusting specimens of games you'll ever come across. Some of them are way past their shelf life and are impossible to restore no matter what you do to them, but others can be cleaned up to mint or near mint condition with a bit of work. The end result of your efforts is a game where you don't feel like you have to wash your hands after handling it.